Britons killed by a gunman in last week's Tunisian beach attack will start being repatriated on Wednesday, Downing Street has said. Foreign Secretary Philip Hammond said the UK death toll has risen to 22, with eight more thought to be from the UK. The RAF flew the last four of the seriously injured back to the UK on Tuesday and they are now in hospital undergoing treatment. Tunisian authorities have arrested several people on suspicion of helping the gunman Seifeddine Rezgui, who had links to the jihadist group Islamic State (IS). Rezgui, a 23-year-old student, was shot dead by police. Security sources say he is thought to have been trained in Libya. A senior official at the Tunisian interior ministry told the Associated Press that Rezgui had been in Libya in January, the same time as two men who attacked a Tunisian museum in March. Downing Street has ruled out a British inquiry into last Friday's attack, saying British police would assist the Tunisian investigation. Mr Hammond said the spread of IS - also known as Isil - into the "ungoverned" territory of Libya had helped to sow the seeds for the Tunisian shooting. He added: "We have been dealing with Isil in Syria and Iraq, we have a significant military operation in Iraq where we are delivering the second largest number of air strikes against Isil targets. "But as Isil has spread across Libya in this ungoverned space it has posed a threat not just to us, but to the neighbouring countries, which sadly we have seen realised in this attack in Tunisia." Downing Street said the government was "working closely" with victims' families and has offered to fly the bodies by RAF plane to Brize Norton in Oxfordshire before taking them home. The joint inquest will be opened by the West London coroner, it added. There is currently a team of 27 people, from the Foreign Office, the Ministry of Defence and the police, in Tunisia, working on security. Foreign Secretary Mr Hammond chaired an hour-long meeting of the government's Cobra emergency committee, involving the British embassy in Tunisia. The four Britons who were seriously injured returned on a specially modified RAF C17 transport plane which had left RAF Brize Norton in Oxfordshire for Tunisia on Monday afternoon. 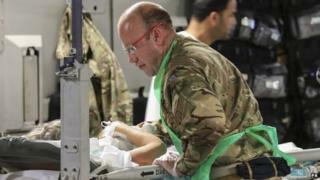 Medics experienced at bringing injured service personnel back from operations overseas were on board. On the return journey the plane flew into Birmingham Airport, where Allison Heathcote, 48, from Felixstowe in Suffolk, was taken off and transported to the city's Queen Elizabeth Hospital. Mrs Heathcote's husband Philip is already confirmed dead, and she has undergone five hours of surgery after suffering from multiple gunshot wounds. A hospital spokesman said Mrs Heathcote remains in a "critical but stable condition, under sedation". The other injured patients were flown on to RAF Brize Norton, and were now being treated at John Radcliffe Hospital in Oxford, Derriford Hospital in Plymouth and London's St Mary's Hospital, Downing Street said. David Cameron spoke to US President Barack Obama on Monday night and Irish Taoiseach Enda Kenny earlier on Tuesday. Three Irish people are also among the dead. Mr Cameron's spokeswoman said they agreed that the outrage had reinforced the need for governments to work together to tackle Islamist extremists and support democratic nations like Tunisia. Tunisian President Beji Caid Essebsi has admitted that the security services were not prepared for an attack of this kind. He said extra security had been put in place at other locations during the holy month of Ramadan, but nobody had expected beaches to be a target. The names of those killed in the attack are slowly emerging. Here's what we know so far about those who lost their lives, as well as those who are injured and missing. Some survivors have also been speaking out about their ordeal. Meanwhile, the family of Janet and John Stocker have confirmed "with regret and great sadness" that the couple from Crawley died in the killing. Tributes are also continuing to be paid to the British victims, including Perthshire couple Billy and Lisa Graham who were staying at the holiday resort of Sousse to celebrate her 50th birthday. Wiltshire couple Eileen Swannack and partner John Welch, who were staying at Hotel Riu Imperial Marhaba, one of the hotels targeted by the gunman, also died in the attack. Eighty-year-old retired Atomic Weapons Establishment scientist David Thompson, from Hampshire, is also believed to be among the dead, according to police. One Belgian and one German are also thought to be among the 38 people who died. At least 36 people were injured. Holiday firms Thomson and First Choice announced they had cancelled all their holidays to Tunisia due to leave on or before Thursday 9 July. Customers can receive a full refund or choose an alternative destination free of charge. Forty-five minutes driving around Sousse and there was little sign of the increased security measures. Worryingly for local Tunisians there was also little sign of the tourists this country so relies on. At the medina locals took to the shade to watch very few holidaymakers walk past the old statues and walls of the bazaar. Sousse's beachfront "train" would not be out of place in Hastings or Blackpool - except for the fact it was empty. The loans to support the tourist industry are doubtless welcome but one wonders if they can sustain this resort for very long. Tour companies have laid on extra flights and about 10,000 British tourists have flown home from Tunisia since Friday, according to the Association of British Travel Agents. Nick Longman, head of Thomson and First Choice, said 22 of the victims identified by the Foreign Office were their customers. He said 4,000 customers had already been brought home on 25 flights and a further 15 flights would bring back 1,900 more by Thursday. It was too early to say what the company's long-term plans were for holidays in Tunisia, he added. The Foreign Office has updated its travel advice to warn that further terrorist attacks in Tunisia are possible, and urged people to be vigilant. The Tunisian government has brought in increased security measures, and the country's Interior Minister Mohamed Gharsalli said 1,000 troops would now be deployed to protect beach resorts. We are seeking your stories relating to the Tunisia attacks. If you or anyone you know has been affected please contact us in the following ways. Tunisia attack: What can UK police do?